Dwayne Johnson stars in this US action adventure based on the 1980s video game. 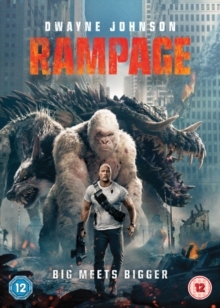 When a genetic experiment goes awry, primatologist Davis Okoye (Johnson) discovers his friend, a silverback gorilla named George, has been turned into a giant rampaging monster along with Lizzie the crocodile and Ralph the wolf. As the massive creatures tear across the country, Davis teams up with discredited engineer Dr Kate Caldwell (Naomie Harris) to discover who carried out the experiment and synthesise an antidote that will turn the animals back to normal before their trail of destruction gets out of control. The cast also includes Malin Åkerman, Joe Manganiello and Jeffrey Dean Morgan.